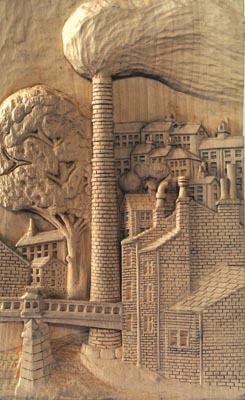 During the months of 2006/7, a unique carved panel was created to help commemorate Overgate Hospice's 25th anniversary of providing specialist care to the people of Calderdale. 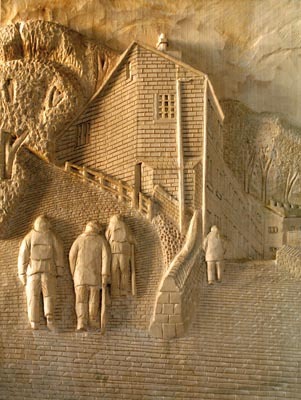 The panel, taking in excess of 5,000 hours to carve and construct, was presented in front of over 150 guests and local dignitaries, to Overgate Hospice by Dr Ingrid M Roscoe, Lord-Lieutenant of West Yorkshire, at Halifax Town Hall in March 2007. 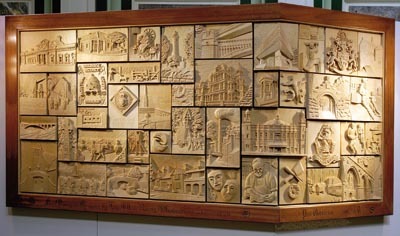 The panel, measuring approximately 2.8 x 1m and made up of forty-one individual relief carvings, depicting local buildings, scenes and activities within Calderdale, was featured on local BBC television and in the press, as well as monthly publications throughout West Yorkshire, before being put on public display in the main hall of the Halifax Town Hall for two weeks. The finished panel is valued for insurance purposes at Â£50,000 and is now mounted in the main entranceway of the hospice. Our reason for undertaking this club project was primarily to highlight the outstanding services Overgate Hospice provides to the local community and secondly, to make the general public aware that woodcarving is still practiced and flourishes throughout West Yorkshire. The concept of a panel had come from three previous panels undertaken by members of the West Riding Woodcarvers' Association. One is presently displayed in Wakefield Hospice and one was presented to the Kirkwood Hospice to commemorate the passing of the millennium â€“ this Millennium Panel was featured in Woodcarving issue 62, January/February 2000. The third panel was presented in October 2005 to the French town of Besancon to commemorate 50 years of twinning with Huddersfield, latterly Kirklees, West Yorkshire. The panel is now prominently displayed in the Hotel de Ville (Town Hall) in Besancon which is a thriving commercial and tourist centre close to the Jura Mountains, and is just an hour's drive from the Swiss border. 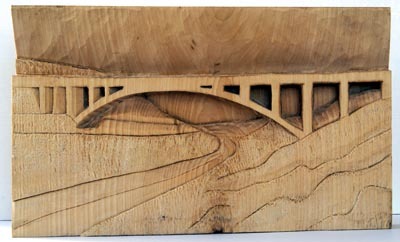 For the Overgate Panel, a sub-committee of the club agreed the overall design and arranged for the timber to be cut into appropriate sizes for distribution amongst the carvers. Each carver was given freedom to alter items slightly to facilitate carving practices. 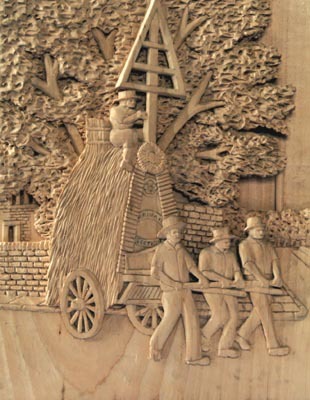 The overall finished dimensions of the panel and frame were agreed at approximately 3 x 1m (9ft 6in x 3ft 6in) but because of its final location in the main entrance way to the Hospice, it would have to be carved and assembled, incorporating a bend of 138 degrees. 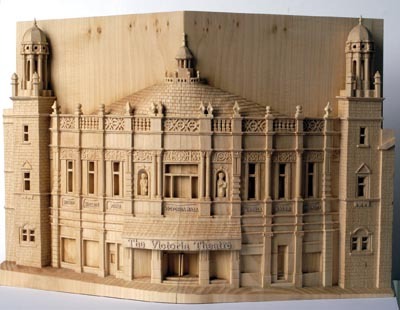 Two of the carvings, Halifax Bank of Scotland and The Victoria Theatre, had to be carved on timber, machined and held at 138degrees to wrap around the wall corner. 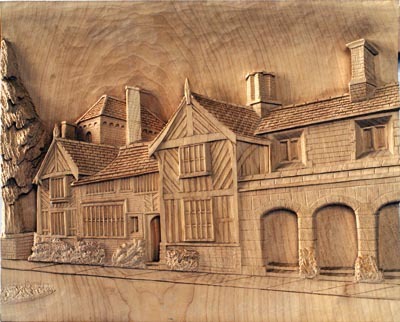 The timber selected was limewood (Tilia spp), which most experienced carvers will agree is preferable for relief carvings that require a high degree of detail, and being undertaken by carvers with varying degrees of practical experience. Forty-one individual relief carvings of varying sizes were to be eventually mounted on a backboard to form the completed panel and surrounded by a custom-made hand-carved frame with the words: "For Overgate Hospice by West Riding Woodcarvers Association 2007 AD. Pax Vobiscum" (peace be with you) running across the base spar in an Old English script. A number of pictures and photographs were collected, and the most suitable to fit the dimensions of the cut timber were photocopied for distribution. Two photocopies were given to each carver: one for reference throughout the carving process and one to be affixed onto the limewood block to facilitate carving and perspective. The degree of experience amongst the thirty-six carvers varied from individuals who had been carving in all forms for many years, to the complete novice with very little experience. The club, which now boasts approximately seventy members, has recently launched its own website depicting members' carvings and details of club projects. On completion, the forty-one carvings were to be treated with a liquid sealing compound to protect the wood from the elements and to ensure that little maintenance is required. The frame wood of utile (Entandrophragma utile) was machined, planed, rebated, mitred, sealed and waxed to a deep red-brown colour to contrast with the mellow tones of the finished limewood. 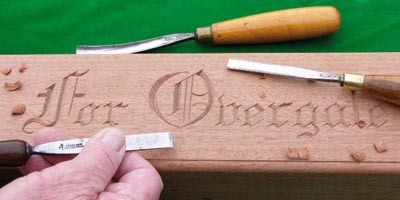 Before the frame was assembled, the base spar had to be carved with the appropriate lettering that was agreed upon by both the club and the officers of the Overgate Hospice. The mitred joints of the frame were planed to ensure a perfect 90 degrees and 138 degrees fit, and held together with good quality wood glue and 150mm (6in) worktop clamps to ensure a rigid joint to carry the weight of the backboard and the forty-one carvings. After fitting the 12mm (1/2in) MDF backboard into the rear of the frame's rebated recess, the inner surround of the frame was fitted with a 6mm (1/4in) limewood bead to form a contrast of colours between the dark utile timber of the frame and the light brown of the carved blocks. The individual carvings are fitted to the backboard by means of screws with a 6mm gap separating each carving. The completed structure required the combined strength of four men to lift and move it into its purpose built protective wooden and padded transportation crate. Because of the impracticality of officially presenting the panel to the Hospice on their own premises with so many club members involved, and the interest generated by television and local press coverage, Calderdale Council very generously allowed the presentation and public display to take place in the Grand Hall of the Halifax Town Hall. On the evening of the 13 March 2007, with the Mayor and Mayoress of Calderdale present, Dr Ingrid Roscoe, Lord-Lieutenant of West Yorkshire, officially presented the panel to Mrs Mary Whitehouse, Chairman of Overgate Hospice, in front of over 150 members and invited guests. The evening was further enhanced by a display of over 100 members' carvings and the beautiful singing of a local junior choir. To accompany the panel and assist in raising funds for the Hospice, a full colour booklet was designed and compiled by the club members, depicting each of the individual carvings and giving a brief outline of the background to each scene within the panel. The photographs for the booklet were kindly taken by the Halifax Photographic Society and the cost of professional printing came to just over Â£800 for 2,000 copies. Through sales at Â£3 each, mainly while the panel was on display at the Town Hall, and after the subtraction of costs, the club was able to donate over Â£1,200 to the Hospice's general fund. The booklets are now displayed with the panel and contribute a small but steady source of funding to the hospice. 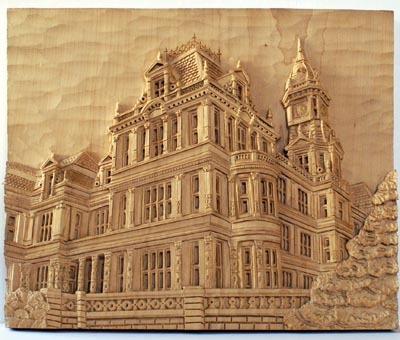 The first meeting of The West Riding Woodcarvers' Association took place in Huddersfield at the Crown Hotel on 11 April 1992 and was initially attended by twenty three-people. From 1992 until early 2007, the Club met at the English Martyrs Church Hall, Dalton, until moving to our current meeting rooms at the Shepley Methodist Church Hall in Shepley, Huddersfield. The club meets on the second Saturday of each month where activities include woodcarving theory and practice, demonstrations and talks by internationally recognised woodcarvers, and talks on wood related matters by our own members and local guests. The club presently has a membership of approximately seventy individuals, both male and female, exhibiting members' work and participating in shows and demonstrations throughout West Yorkshire. 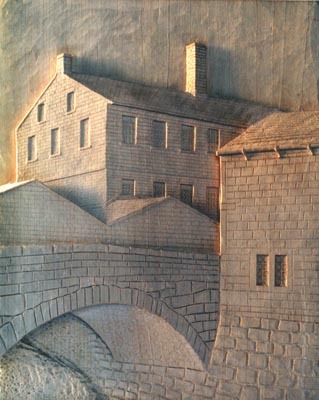 We run, or are involved in, five woodcarving classes: three day and one evening class in Huddersfield, plus a further evening class which started in 2007 at Brooksbank School, Elland, to further accommodate members unable to attend day classes. We occasionally apply for grants to help cover material costs on some of our larger projects that will eventually be displayed by a charitable organisation. 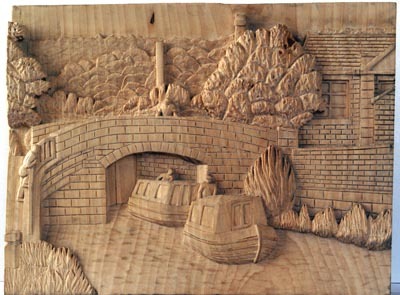 For more information on West Riding Woodcarvers visit their website. The Community Foundation for Calderdale was formed in 1991 and is part of a network of sixty-four similar Foundations across the UK. It is a charitable body that draws its income from individuals, companies and organisations that seek a professional grant making body to administer charitable funds. The Foundation raises, manages and distributes funds to community and voluntary groups to improve the life of people in Calderdale. It holds a long-term endowment fund set up with money from donors. This generates interest, which is given out as grants to community and voluntary groups, providing a long-term stream of funding to help the community for years to come. As well as having its main endowment fund, the Foundation manages and distributes grants from other sources of funding, such as Government grant schemes, increasing the amount of funding the Foundation can access to benefit the community across Calderdale. 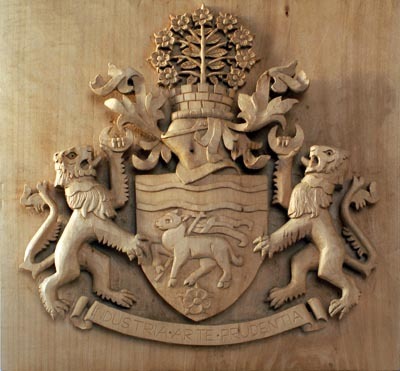 The members of the West Riding Woodcarvers' Association are indebted to the Foundation for a grant of Â£11,570 to assist with the purchase of the limewood for the individual carvings, the utile timber for the frame, specialist lighting over the panel at Overgate Hospice, and fixing materials.